In Western culture, calling someone a snake is considered fighting words. But in the Asian countries that celebrate the Lunar New Year, the Snake is viewed as the wisest and most enigmatic of all the zodiac creatures. In fact, it's such a strong sign of intelligence and luck that an ancient Chinese saying notes that finding a snake in one's home is great fortune and ensures that the inhabitants will never go hungry. For designers Joe Gault and Avi Dunkelman of MIX Design Group in Toronto, and calligrapher Tan Chao Chang, the snake was originally conceived as a three-dimensional object, so it was essential that this dimensionality be present within the stamp. According to Dunkelman, the design team spent months consulting a number of experts in Chinese culture, including curators at the Royal Ontario Museum, and tested designs on his financial planner and Joe Gault's dentist, who are both of Chinese origin. "There's always a concern of creating something that might work graphically, but offend Chinese Canadians." Technically, the design team was allowed to use two finishes, gold foil and embossing. In addition to the right lighting, the right shadows in the flat image, these finishes were used to create a three-dimensional effect of the snake slithering through the water. Incorporating the water element graphically, through the circles and waves – and then selecting areas of the snake for foiling enhanced the 3D effect. 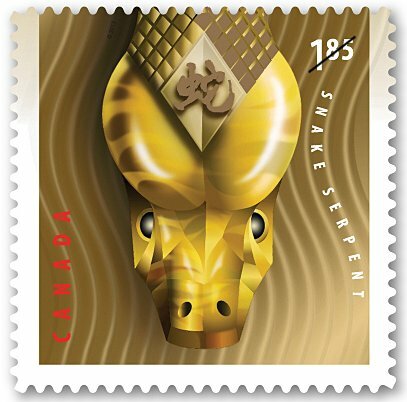 Dunkelman adds, "The passion for this project and the openness to experiment – from Stamp Design Manager Alain Leduc, Gravure Choquet (foil stamping and embossing) and Lowe-Martin (printing) – is what made this stamp issue what it is." Says Leduc, "We hope that we have met the challenge of continuing to surprise the collector and the mailer with this annual issue. This design, combined with the multi-level embossing technique, has achieved the best three-dimensional effect possible on stamp paper. The illusion of the snake floating on the water is, I think, stunning."